We are open from April through September. 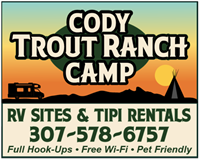 Located just five miles from Cody the Cody Trout Ranch Camp offers a truly unique vacation experience. Rent a RV Site with Full Hookups or stay in one of our spacious tepees on the picturesque Shoshone river bank. We offer campfire pits, laundry facilities and clean bath/shower facilities. You'll love sitting and relaxing by a nice fire underneath the beautiful starry sky and being lulled to sleep by the sound of the running river. If you're the adventuresome type, you can catch your own dinner. 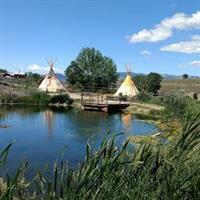 Our Tipi Camping Guests may try their hand at fishing the river, on your own or with a guide. Since the property is a Trout Hatchery, our RV Site guests may fish without a license in our catch out pond where catching a fish is guaranteed! RV Site guests must pay for trout that you catch and we clean and bag for you. Great for the young and old alike; all equipment is provided for Pond fishing. We are open from April through September. The Cody Wyoming Trout Ranch is becoming a leader in the production of trout for stocking private ponds, streams & lakes. We also provide equipment, feed and services related to a healthy trout habitat. We also offer pond & lake aeration equipment and installation. We have experienced and knowledgeable professionals to help you every step of the way in getting you all set up. You will be dealing with a skilled management team with a focus on providing you incredible customer service and satisfaction. RV sites and Tipi (Tepee) rentals. 30' x 60' pull-through RV sites. Located at 4727 Powell Hwy., Cody, WY. Look for the Billboard on Hwy US Hwy 14-A toward Powell, 5 miles out of downtown Cody! The property is located on 25 acres on the Shoshone River.